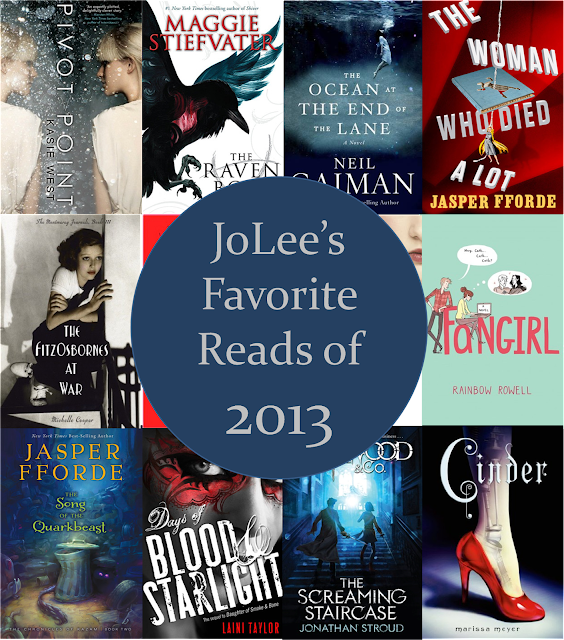 2013 was a good year for reading (most years are). I read 75 books. My reading habits shifted a bit this year as I stopped reading on my iPod after weaning Felix and moved back to paper. Then I moved back to e-books when Nate gave me a kindle. I am still kind of loving e-books. I also received more review copies than ever before. I stuck a toe into the book blogging world at Intellectual Recreation and Red Letter Reads. I made my first visit to Book Expo America. I also returned to Young Adult literature after a pretty significant break from the genre last year. I listened to more audio books than I have since we moved from Kansas. In fact, more than half of the favorites below were consumed in audio format. Officially I had my first encounter with Rainbow Rowell last year when I reviewed Eleanor&Park for Red Letter Reads in December. Rowell's writing is swells in your chest as you read and settles there to stay. Eleanor&Park is the kind of quiet story that creeps up on you and, before you know it, you can't seem to put it down. Fangirl is a bit more fun with some serious stuff mixed in. The idea of writing a novel about a fan fiction writer is brilliant. Who knew that what I was missing in my life was a cyborgian retelling of Cinderella? Only everyone who had already read Cinder. Cinder lives in a post-World War IV world that is threatened by both a terrible pandemic and the queen of Lunar. I'm a little late jumping on the Lunar Chronicles band wagon, but I see that as a good thing. I won't have to wait as long for the sequels. Bill Bryson's 19th-century home inspired him to write a book about the history of houses, but it is comprehensive in the extreme because in Bryson's hands the history of the house becomes the history of humanity. I could not stop talking about this book. Many of my friends were subjected to my constant chatter about this book, and it actually inspired many of them to read the book (and they liked it)! I kind of have this thing for parallel/ divergent realities right now. Pivot Point was my favorite. I wish I could read the sequel now (or better yet, yesterday). Addison Coleman is a Searcher. She lives in a compound with other individuals who have supernatural mind powers. Addison must chose to stay in the compound with her mom or leave and live life as a Norm with her dad. What follows is the search of her two possible futures. Everything about this book came to together just right for me. The two futures dovetail nicely and set up quite a bit of dramatic tension for the reader. Kate Crane of The Cranes Dance is a professional ballet dancer for a company in New York City. Gwen, a star of the same company, recently suffered a nervous breakdown and returned to Michigan to recover. Kate takes us through the injuries, the practices, the performances, the glittering successes and stresses of a professional dancer. However, Kate is also seriously struggling Gwen's absence who is always present in Kate's mind. And Kate's mind is not serving her well these days. Last year the first in this series, A Brief History of Montmaray made my best of list. Because I love this series so much, I am pushing it on you again. In The FitzOsbornes at War the characters have some pretty heavy stuff to deal with--lots of new and harrowing situations and lots of growth for all parties. Parts of the book brought me to tears and other parts made me laugh. I'd like to read more books like this. Actually, I think these books would make a fabulous BBC mini-series. Anyone want to work on that? This is Maggie Stiefvater's fourth appearance on the Favorite Reads round-up. I read the first two books in The Raven Cycle this year. And she does it again. The characters, the setting, the language--it's all great. I loved these creepy tales, set in a small Virginia town. I am blown away by how well Stiefvater depicts a tight-knit gang of boys. I love those Raven boys. I have a deep and abiding love for all of the Thursday Next books, and The Woman Who Died A Lot is one of the best of the bunch. This sequel has tons of hilarious moments, and the bigger plot blew me away with its awesomeness. Being able to listen to a Thursday Next book on a long bus ride to and from New York makes that long bus ride much, much better. Favorite Dose of Humor: The Song of the Quarkbeast by Jasper Fforde In a Favorite Reads first, Jasper Fforde becomes the only author to have more than one book on the list in any given year. (And you thought I hadn't pushed his books enough as I recommend them to friends, neighbors, semi-acquaintances.) The Song of the Quarkbeast is the second in Fforde's first Young Adult series. I love how Fforde upends our expectations for the fantasy genre in these novels. I grinned the whole way through this book. Neil Gaiman has a magic touch. The Ocean at the End of the Lane is a short little tale. It reads like the short story it originally was, but it is kind of perfect. I do always love to hear Neil Gaiman's voice. I saw Neil Gaiman speak about this book earlier this year (it was a truly bizarre experience seeing and hearing the man speak when I'm used to him being a disembodied voice), and he spoke a bit about how this book is linked to his hometown and childhood. It obviously veers greatly becoming a work of magical realism, but I liked knowing there is a connection there. I had good memories of reading Frankenstein in college for Humanities 350, and I enjoyed it just as much, if not more, the second time. It was one of my favorite book club discussions. I was surprised the second time around how readable I find the book. I clipped right through it. Read it. It's not what you expect. Laini Taylor kind of blew my mind with Days of Blood & Starlight. I am endlessly fascinated by the Chimera. I think I could read a whole book filled with just descriptions of the Chimera--what they look like, what they sound like. Both Karou's and Akiva's stories are really well developed in Daughter of Smoke Bone. And the set-up for the next book ... well let's just say that I am not sorry that I waited so long to read this book because now I won't have to wait so long for Dreams of Gods & Monsters. I have not stopped talking about, thinking about, or recommending The Screaming Staircase since I finished it. The characters, the world, the writing, the atmosphere, and the pacing all come together perfectly. Most of all, this book is scary. I listened to the audio book and, while the narration is just lovely, I cannot condone nighttime listening, unless you want to be totally creeped out. I did not listen to my own advice and was lying awake in my bed on more than one occasion. P.S. Favorite Reads from the past. And of course the Raven Cycle and the Lunar Chronicles. Such consistently entertaining series!